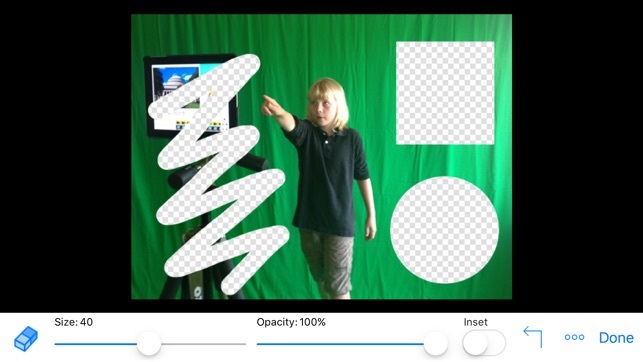 "Versatile, easy to use movie maker yields great results...numerous uses for student projects...kids will have a blast using their imaginations.." – Common Sense Media, Graphite. 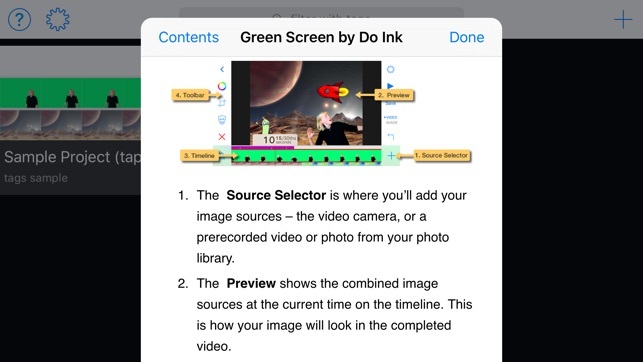 Created by the team who also created the Animation and Drawing by Do Ink app for the iPad, featured in App Store Essentials: Painting and Drawing" and recipient of the Editor's Choice Award from Children's Technology Review. Please send any suggestions, feedback or questions to support@doink.com. We value your feedback and suggestions, so feel free to get in touch! And our usual friendly reminder… positive reviews in the App Store really help, so if you’re loving the app, please take a minute to let people know how you feel. We really appreciate your support! As a video artist, this app is fantastic. I stumbled upon this by chance because I needed a decent chroma key app for on-the-go video art. This app is a DREAM. I am giving 5 stars because this app needs love and it’s the only one in the App Store that does what it does so well. It does have some places it can improve but, you know, later version or something. I’m patient. Work area is touch friendly. Projects can be saved and loaded later. Chroma Key can be adjusted to any color/sensitivity. Interface is simple enough to use. More adjustments for chroma key - edge blur maybe? Keyframes! I love how I can positing things in the editing window via touch. It would be even cooler if those things could change positions over the course of the video. With three layers, you could do a great parallax effect. A couple more editing buttons? Or at least a “split clip” option - “trim” only goes one way. On the whole, this is my favorite chroma key app on this platform. Definitely worth a try. Thank you for the compliment on our app and review. We have noted your feature requests. Wanted to let you know that "trim" goes two ways as shown in this tutorial https://www.youtube.com/watch?v=izVwOxSV5BA&feature=youtu.be Feel free to email us support@doink.com if you have any questions or would like to dialogue. Thanks! I have one too many problems. Basically, your app decides to crash, A LOT, but sometimes it’s worse than others. Best crash, keeps progress, doesn’t crash again. Bad crash, deletes half of your progress. WORST CRASH, IT DOESN’T EVEN LET YOU INTO YOUR OWN PROJECT. EVER. IT’S COMPLETELY GONE, AND YOU CAN’T BRING IT BACK, BECAUSE THERE’S NO WAY AROUND IT, AND ALL YOUR HARD WORK IS GONE. This happened to me numerous times, and it’s just getting out of hand. Fix your app. I swear, this is the worst. Just worked on a 12 second video for about an hour, and this is what you give me. Nuh uh, you ruined my experience, and I don’t care if I’m being harsh, you need to work on it if it’s meant for 3 minute green screen videos. I wasn’t even using that much, usually I use like 40 videos, but I put in like 14, and you decide to lock me out then? Imagine you worked all your energy and soul into your project, and it locks you out for no reason at all. Explain. FIX. IT. NOW. ALSO UNLOCK MY PROJECT SO I CAN FINALLY SAVE IT. I'm sorry to hear you are having problems. Please email support@doink.com with details so we can help. In particular, please tell us what model iPad or iPhone, what Apple Operating System you're running, what version of our Green Screen app, how long is your video and how many different media sources (photos, videos) you are using. Thank you. Good, but only for limited use. I purchased this app for editing videos, that way, for instance, I could make a space show and not have to build any permanent sets. However, whilst testing it out, I found that you could not export a video. Like you cannot under any circumstances. Too if you are serious about doing a green screen, this app has some trouble filtering out the green tint around the edges. With very, very careful editing you can almost get rid of it, but it isn't likely you'll get a completely clear, unblemished video. I give this 3 stars as an app to jokingly prank your friends that you traveled somewhere or just as a little fun project, but I would say it is completely unusable for serious pursuits. © 2018 DK Pictures, Inc.